Karl Watson — Switch 360 flip at Burritoville in 1994. Photo via Ryan Gee. If you’re in Australia, you can buy QS gear with free shipping here. Ryan Gee joins the ranks of Lucas Puig as one of two Instagram users producing watch-worthy IG videos. He’s been posting long lens B-roll angles of various notable tricks from the early 2000s, e.g. Brian Wenning’s switch back tail big spin, Stevie’s hardflip front nose, and Kalis’ Rockaway line. There are also some motion sequences on there too, e.g. Kalis’ fakie 5-0 over the three at Love or Kerry Getz at City Hall. You might remember an incredible natural-looking quarterpipe spot from the Busenitz “Euro Lines” video. Well, it’s quite obviously a skate plaza, albeit an insane one, based on this Austrian DC video. As Americans, how crazy is it that a city would allot such a prime swath of public space for the sole use of skateboarders? Zered Bassett has a “Day in the Life”-type video with some cruiser footage and a photo feature over on the Dew Tour site. Who wants to go half on a Code Red? Hey, you know that thing about skateboarding’s favorite jazz song? Yeah, it retained its title with the new Krooked circle board clip. The Accidental Playground is a new book about unsanctioned use of the Williamsburg waterfront in the early 2000s, before it was redeveloped. Just ordered it off Amazon, so there’s no telling how much of its 300+ pages are dedicated to skateboarding, but given that there’s a skate photo on the cover, you’d think it’d be a big chunk. Eighteen classic video parts are being screened alongside a live classical piano rendition of their respective songs. Though a photograph of a skater holding a book does not verify literacy, the stories about managing skaters in a retail environment are priceless. 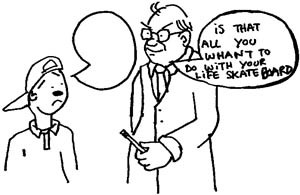 In light of the recent demise of Skateboarder, former staff writer, Mackenzie Eisenhour, scanned a 2002 interview with Steve Rocco, which was conducted five years before The Man Who Souled the World was even released. 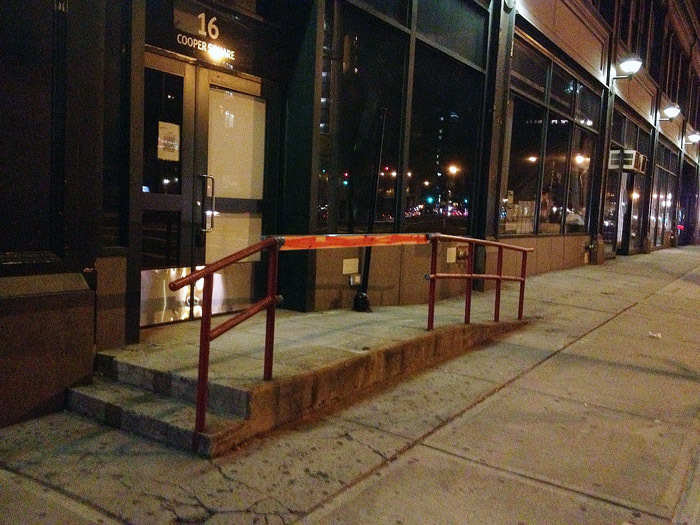 If you’re good at skateboarding and like bumps to rails, it might affect you in knowing that the handicap rail on Bowery and 5th Street is gone. They cut the flat part out. QS Sports Desk Play of the Week: Derrick Rose is still faster than everyone. What’s better: Dreamchasers 3 or the new Cam’ron tape? That Austrian plaza is not a skatepark. I was going to put it on the Innovative Skateparks list a while back but after some research I discovered it is not a purpose built skatepark. Wow. Figured the last link in the post implied it was a skate plaza, or at least a “multi-function” plaza, as they’re known to be called nowadays e.g. Paine’s Park. If that’s a natural spot, it’s the equivalent of building a football stadium and then calling it an installation. karl watson has and will always be ahead of his times.